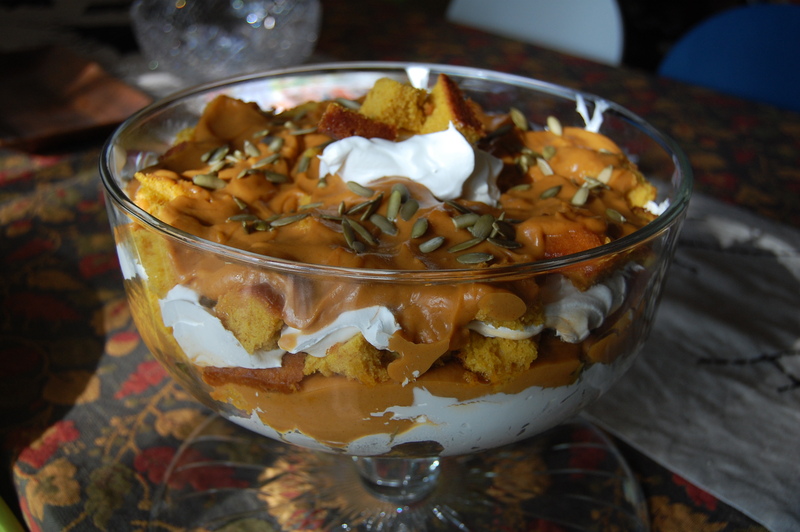 Pumpkin Tres Leches Cake fail = Pumpkin Trifle Success! So here’s a story of trying to turn a negative into a positive. I had this brilliant idea of making a pumpkin tres leches cake. Turns out not so brilliant. I found this recipe for a tres leches cake in one of my books and I wanted to autumnize it by adding some pumpkin. Now after looking the recipe over, I had my reservations about the recipe since it called for reducing the soaking milk mixture by half. I thought that would be extremely thick and would not get absorbed by the cake. But let me backtrack a little bit for some folks that might be confused. For those who aren’t familiar with a pastel de tres leches, it is the “Three Milks Cake”. The cake used is a very dense sponge cake which is then soaked in a sweet mixture made of three milks. The three milks used would include: evaporated milk, sweetened condensed milk (I could eat this crap right out of the can! ), and whole milk / heavy cream. Its origins can probably be traced to Latin America, either Nicaragua or Mexico. From what I can tell, the recipe was part of a promotional campaign by a canning company to help drive sales of their milk products. Clever marketing! What about a trifle? It’s a nice way use up some cake that might not have turned out the way you wanted. 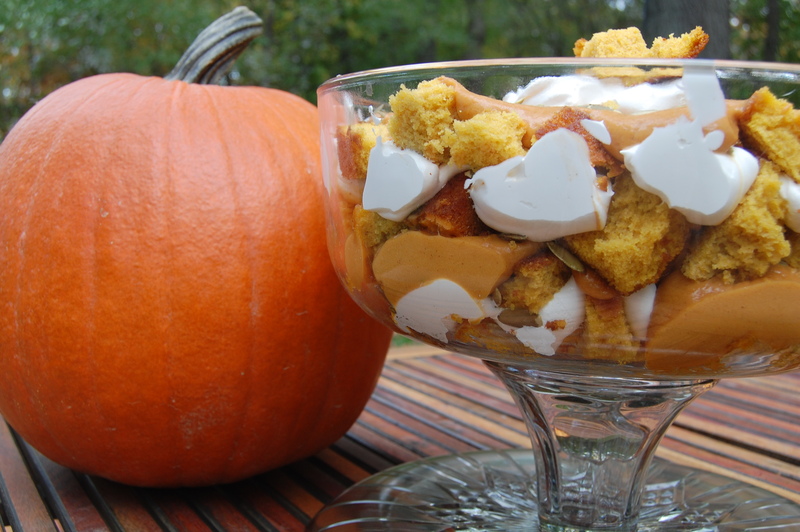 Now here’s a recent post from a fellow blogger with her very tasty version of a Pumpkin Trifle. It sounds like this is the way to go. I did have a lot of higher aspirations involving fresh cinnamon whipped cream and pumpkin butter and candied pepitas, but as the day wore on and errands started piling up, I took the easy way out and Sandra Lee’ed it. I am so ashamed of myself, since I always seem to be on the “made-from-scratch-high-horse”. Hopefully I don’t start turning to Rachel Ray for culinary advice. Unless you like those two, then they’re lovely. But to make up for it, I made some lavender pepita croquant to garnish a marbled pumpkin cheesecake. 1. Cut the cake into about 1″ cubes. Toss the cubes with just enough rum to moisten the cake. You could omit this if you like. 2. Spread out a layer of the cake cubes. Top with a layer of the whipped topping, followed with a sprinkling of pepitas. 3. Now spread out another layer of cake cubes. Top with a layer of the pudding, and again sprinkle with the pepitas. 4. Alternate steps two and three until you get to the top of the dish. Garnish with a dollop of whipped topping and sprinkling of pepitas. You can serve immediately or refrigerate until ready to serve. Notes — I don’t have a dedicated trifle dish so I had to use my cake dish / punch bowl. When I do make trifles, I usually make individual ones so I have no need for a large dish. I think it did a sufficient job, but it was a little bit too wide. . . Since the cakes that I had used were dry, it was helpful in my case to let everything sit for a bit rather than serving immediately. This entry was posted in Cakes, Culture, Mishaps, Recipe and tagged Cakes, Culture, Food, Mishaps, Recipes. This must be an “I Meant to Do That” Dessert, or what I always refer to as a happy accident. Sometimes things go the way they’re *supposed to* rather than the way we *think* they’re supposed to go. And deliciousness of one sort or another ensues. Hooray for you!